This dish was made for a picnic and as such it is served cold. I guess you could serve it hot too, but I think it works nicer as a picnic-style cold dish. 1. Cook your penne, drain and put in ice water to stop the pasta from cooking any more in its own heat. 2. Mince a clove or two of garlic and add to a nice big glug of olive oil in a small bowl. 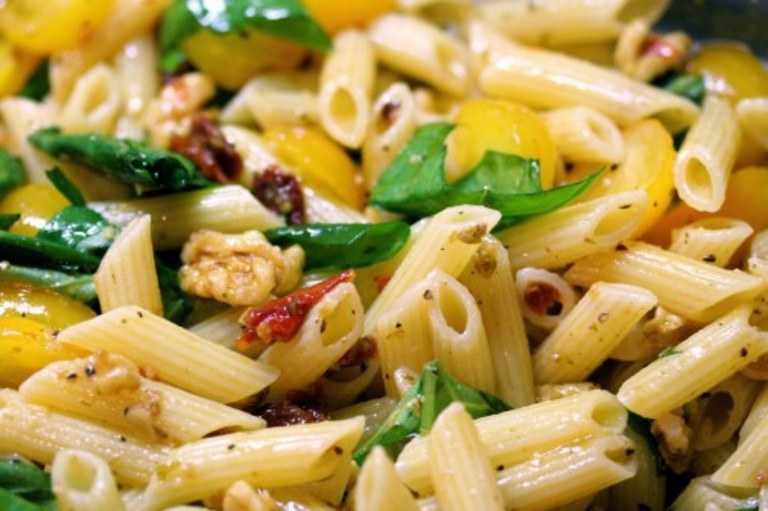 Add a handful of sun-dried tomatoes to the bowl and distress them with a fork so they flavour the oil slightly. Add a handful of walnut pieces (don't crush them, just break them into generous pieces). 3. Slice the yellow tomatoes and salt them. Salting the cut side of a tomato will help draw out the moisture (pat it with a paper towel after a few minutes) and helps improve the flavour. 4. Drain the pasta. Pour the oil mixture onto your pasta, add the yellow tomatoes, a generous handful of chopped fresh basil and give everything a good stir. Season with salt and pepper.